For the past five months, the War Memorial Opera House has been filled with a glorious collection of classic and contemporary ballet. A force and display of true artistry, the 2016 season at San Francisco Ballet saw returning favorites, new commissions and three full-length narratives. Saturday night, the curtain rose on the final program of the season, the last of those story ballets, John Cranko’s three-act Onegin. Onegin is a visual stunner, from the choreography to the costumes to the design. But the story itself is not a light or happy one. Onegin is about regret and acceptance, choices and consequences, and while there are some snippets of joy and playfulness, the narrative is heavy, to say the least. I saw four years back, with the exception of Strongin. And though they certainly had less stage time, Act I really belonged to Strongin and Nedvigin. He was a wonderful Lensky – charming and chivalrous - and she was exactly what you want Olga to be. Sweet, innocent and gentle, yet confident and with a sense of purpose - from the first solo’s balletés and ballonés to the encompassing fifth position port de bras. Interesting directional changes in the turns and daring, unexpected catches featured heavily in their ‘courting’ pas de deux. And they led the corps in one of the most dynamic sequences in the entire Act - a long diagonal series of supported jetés. The corps also had some lovely folk variations, though the choreography for the men was definitely more intriguing than that for the women. Extreme circumstances befall the characters in Act II. The mood begins with celebratory elation – Tatiana’s birthday. The cast enters the stage with full partnering and sprightly footwork; flowing waltz steps and grand assemblé lifts. Mid-way through, things start to go awry. Onegin rejects Tatiana, begins flirting with Olga and in the end, is challenged to a duel by Lensky. Again, it was Nedvigin’s night. His solo was full of heartbreak, distress and sorrow – arms reaching out, chest lifted to the heavens, turns that coiled one way and then the other. Act III is the place where memory and reality converge. Onegin returns after a significant passage of time and we see choreographic motifs from the first two Acts recur. But they are in fragmented pieces, as is he. 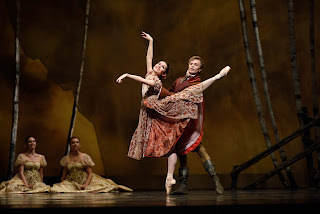 Then he sees that Tatiana has married Prince Gremin (danced by Joan Boada). Kochetkova and Boada’s pas de deux was a highlight, not just because the dancing was phenomenal but also because of her character’s transformation. Time had gone by and so of course, Tatiana was older. But more than any other moment in the ballet, you could see that she was so different – measured, elegant and content. Onegin’s last scene brings a passionate and final duet for Onegin and Tatiana. With literal twists and turns, struggles and abandon, the dance shows their pull towards each other as well as their eventual acceptance of what is.